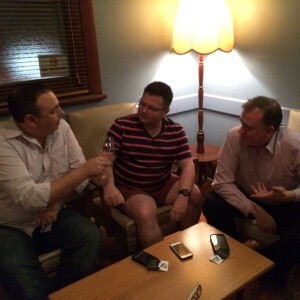 032 – Who brang the Adelaide beer? There is a new brewing enterprise in town and the Boring Adelaide crew was invited to record live from the launch at the Wheatsheaf Hotel. Big Shed Brewing has taken a number of pubs by storm and Jason Harris talks us through the beer and the vision while enjoying the title of South Australian Drink Of The Week. And after a month of deliberation, we finally whittle down the shortlist for the Official South Australian Care Package. You might be surprised by what does and doesn’t make the cut, as well as the missed opportunity to say ‘Adelaide Breathe’ the next time you take a bath. In Adelaide’s Yesterdays, Colin shines his Pearl, the Adelaide Visa Council rejects a visa based on some piercing comments about our town from a body modifier, and the Villenettes get nasty in style. PLUS it is time for another Baristador Coffee group roasting (that’s our sponsor and Steve’s brand). Not only do you hear the new Baristador jingle in this week’s episode – written and produced by our own Brett Monten – but there’s time to slip your order in for some double roasted espresso with a caffeine strength you prefer. Order before midnight on Monday, April 7, on the Baristador Coffee order page. Intro: Our original theme song is here, Adelaidee Hoo. Note, throughout the podcast we also use free sfx from freesfx.co.uk for the harp, the visa stamp, the silent movie music, the radio signal sfx, and the swooshes around Siri. South Australian Drink Of The Week: Big Shed Brewing Franken Brown and F’ Yeah American Pale Ale. Tasting notes. Shout outs: Steve said hi to Baristadorians. Colin said hi to Michael from Tenefete. Brett said hi to his podiatrist for putting up with stinky feet. Stories without notice: Steve mentioned the mention of Adelaide on The Bugle podcast. Colin mentioned KoKo Black coming to Adelaide and a new car loan scheme. Feature: We finally decided on the South Australian Care Package final contenders. Listen in to hear them. Special awarding of personal visas to @TheShowPBAFM team for their photo, below, proving their love for all things Adelaide. Adelaide’s Yesterdays: Barossa Pearl. Colin reminds of the defunct wine label destined for a comeback. Brett’s Musical Pilgrimage: The Villenettes with Set You On Fire.